This is a guest post by our research aide, Giulia Pasciuto, who has been leading a research project I am collaborating on with the Seattle Women’s Commission to better understand the barriers and solutions to healthy food access for women in Seattle. Food Access is a significant problem for low-income women in Seattle. 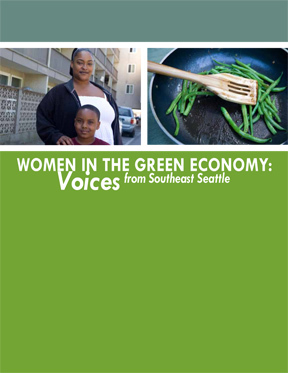 In 2011, a community member from Delridge approached a Commissioner with the Seattle Women’s Commission (SWC) and shared her personal struggle with accessing healthy food in her neighborhood. Namely, she was grappling to find a way to bring a month’s worth of Women Infant and Children (WIC) benefits – several heavy bags of groceries with a month’s worth of dairy, formula, and other healthy food— home on public transportation with her children in tow. After this moving testimony, the SWC undertook this research project and reached out to Seattle City Councilmember Mike O’Brien and the Seattle Office of Sustainability and Environment. Women throughout this city, but especially in Delridge and many neighborhoods in the South part of Seattle, face geographic, transportation, cultural, and cost barriers to finding healthy food for themselves and their families. Delridge is a neighborhood defined by a vibrant and diverse community of families and youth, great assets like the Community College, park and open space, and cultural resources, but unfortunately does not have any grocery stores along the 4-mile corridor, transit service is limited, and the neighborhood itself is framed on the East and West by two tall ridges making it hard to walk or bike to and from the neighborhood. Inaccessibility of healthy food has led to the proliferation of health disparities in Seattle neighborhoods: increased instances of youth and adult obesity, diabetes, and heart disease occur in neighborhoods with limited access to healthy food. This is not news for Seattle policymakers and advocacy organizations; countless studies and myriad programs have been implemented throughout Seattle neighborhoods. The Seattle City Council has adopted the Food Action Plan, which outlines strategies to improve existing policies, programs and recommendations for the council to explore new approaches to address food access in Seattle. However, as community members have stated – these policies aren’t ‘trickling down’… YET. New geographic-specific research on barriers to food access for low-income women will be beneficial to informing how we craft or implement new policies for the Delridge neighborhood, with the potential of impacting neighborhoods around the city. In conducting new research we wanted to ensure that we were leveraging existing research and not duplicating past efforts. A large grant from the W.K. Kellogg Foundation funded the King County Food and Fitness Initiative, which brought together community and city partners in the Delridge/White Center neighborhood to address the impacts of living in a geographically isolated “food desert” with limited walkability. Once funding unexpectedly ran out, the public and city focus on the neighborhood faded and the community capacity to continue the work slowed. This research along with studies by the Seattle Office of Sustainability and Environment and environmental justice organization Got Green have shown that physical access (i.e. location of stores, transportation options, and geographic barriers) and cost (i.e. cost of healthy food compared to unhealthy, processed food, cost of the corner store compared to that of a grocery store, cost of organic and local options) represent the two most significant barriers to healthy food access. With this in mind and the existing food access groundwork and community capacity in Delridge, we decided that we could delve deeper into both physical access and cost barriers with residents while prioritizing and developing a policy framework that addresses their needs directly. Our project goals are as follows: refine a specific, actionable 2014-2015 food access work plan for the Seattle Women’s Commission, CM Mike O’Brien, and the Food Action Plan Inter Departmental Team (representative from the Department of Planning and Development, Human Services Department, and other city agencies) based on the expertise of impacted low-income women in Delridge. Use the experiences of low-income women and the barriers they face to prioritize and delve deeper into food policies and interventions in Delridge. So Far: We have carried out two community workshops, beginning with the Food Empowerment and Education Sustainability Team (FEEST) made up of Chief Sealth High School students. As they describe their work, “FEEST is an after school program at Chief Sealth High School and Evergreen High School. We do improvisational cooking in the kitchen where we prepare a delicious and healthy meal. Then we eat together family-style while learning more about food and its impact on ourselves and our communities.” Volunteers from CM O’Brien’s staff and the Seattle Women’s Commission prepared a healthful meal from mainly local produce, which allowed students to participate in the workshop and then share the meal together. The top priority for these students was increasing economic opportunities for themselves and their families. They felt that having better jobs and more affordable prices at the store and famers market would increase access to healthy food in Delridge. A FEEST member blogged about her experience in the workshop, which we will cross-post here shortly. Our second workshop was co-hosted by Delridge Neighborhood Development Association, a community developer of affordable housing and runs the Youngstown Cultural Arts Center in Delridge, and was attended primarily by groups working to address food access in the neighborhood through community gardening and cooking education (The Little Red Hen Project) and folks working to launch the Delridge Produce Co-op set to open in August on the ground floor of a new supportive housing development owned and operated by the Downtown Emergency Service Center (DESC). The top priority for this group was to make it easier to sell locally grown produce directly to Delridge residents and to open a farmers market at the STEM School. We have at least one more workshops in the pipeline; please look for updates on the project later this month.